Indian dairy sector forms the biggest part of Indian economy and also the largest milk producer across the globe. Major revenue is earned through this sector in India. It is because of the underlying fact that the entire rural population, which contributes to over half of the total Indian population, drives the dairy sector in India. It is only because of the farmers that the dairy industry has been blooming exponentially. If the farmers all over the country are brought together on a single platform, the Indian dairy industry will surpass all other giants around the world. It is a big challenge to bring about such transformation and maybe next to impossible. But beginning is half done. 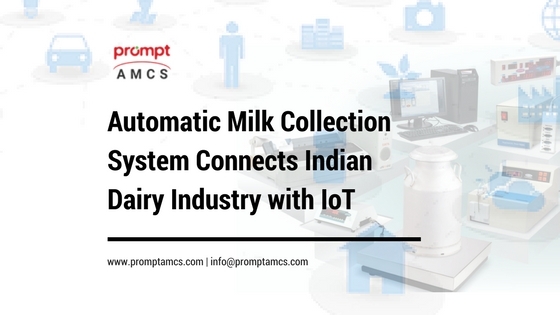 Amul, the biggest dairy industry in India has, in association with Prompt Group, has taken up this initiative to make this dream come true through common software system that has already been running quite successfully in Gujarat. The milk procurement process is run by three major stakeholders, farmers, milk cooperative societies and milk unions. To connect and all of them in a single platform and bring about transparency, AMCS provides various mechanisms. A farmer is provided with Farmers App that enables him to keep track of his entire business. It shows him how much quantity of milk he is giving to the milk society in morning and evening, what is the amount of fat and SNF, how much he was paid, amount credited in his account, complete passbook of his bank account, compare how much milk he gave last month/ year, how much fat SNF was there and how much cattle feed did he buy from milk society. It gives full information of transactions with milk societies imparting easy business management. “Our objective is to reach out to all 18,000 village cooperative societies through this app. It will enable us to link farmers and his village to a product made out of his milk being sold anywhere in India.”, as quoted by Sodhi. Thus, Prompt automatic milk collection software is an extremely significant project in Cow to Consumer process. Peculiarity of this project is that there exists just one AMCS software in entire Gujarat. A centralized data management system is maintained at one place for data analysis, milk production estimation in any district or village or route, to identify and analyze milk production variation based on seasonal and climatic conditions and for future milk production estimations. Earlier, officials had to commute and visit each and every village to meet farmers to discuss about their concerns and solve them. But now, thanks to Prompt AMCS project, they can monitor, all activities going on in any district or village sitting at one place and based on that, take necessary actions. They can also manage and respond to farmers’ complaints and issues centrally. One salient and eminent feature that Prompt AMCS offers is Cashless Society. Previously, payments to farmers were made on weekly or bimonthly basis. Owing to Digital India initiative, it will become easy to deposit money directly into farmers’ accounts as they will be automatically linked to milk society’s bank account. Besides, farmers will receive instant notifications whenever payment is credited in their accounts. Hence, AMCS project stands extremely important for all these activities in coming days. A milk producer, basically a farmer, can keep track of his business and all the essential information useful for future decision making, altogether proving to be favorable. The beneficiaries of this project will be all the stakeholders like farmers, district union officers and the federation. Apart from this, the whole system will become transparent. RS Sodhi, while congratulating the entire team including members of milk societies for their invaluable contribution, district union officials for supporting this initiative wholeheartedly and Prompt Group for taking up this project, implementing and making it possible, expressed his wish that the Prompt AMCS reaches out to all the milk societies all over Gujarat. There’s no doubt that Prompt AMCS project has brought in digital transformation throughout many villages in Gujarat. The mindset of people is changing and so is the nation. India is on its way to bridge the gap and become a developed nation. And with the help of Prompt AMCS project, it will turn possible to what seemed to be next to impossible on the surface.